The survival of the Angry Birds is at stake. Dish out revenge on the greedy pigs who stole their eggs. 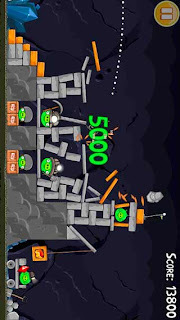 Use the unique powers of each bird to destroy the pigs’ fortresses. Angry Birds features challenging physics-based gameplay and hours of replay value. Each of the 270 levels requires logic, skill, and force to solve. This free android game is just awesome! I played over all levels twice! The graphics are cool, but I think the most important fact that makes this game so addictive is it's gameplay! The brand new idea on the mobile phone! In fact the basic skill to play this game is so easy, just need to touch and drag the bow, then throw the birds out to hit the pigs and their house. But when you play over several levels, you have to plan, how to use the limited birds to destroy the pigs' house, and that would need more skills, always, you have to play again and again to pass a leveal. This android action game is very popular, it got about 50,000,000 players, and got about 4.3 stars average, rated by about 262,333 players! I have downloaded this game on my ipad. I like the most angry bird sounds. All the levels and graphics are really interesting.